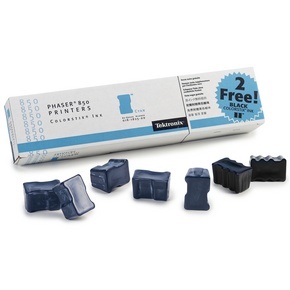 Not yet convinced that switching to a solid ink printer is a good idea? The Xerox Phaser 850 might just convince you. 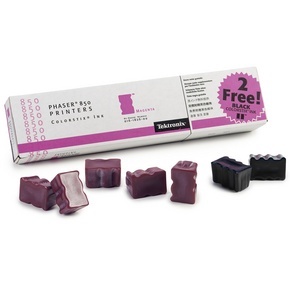 With solid ink technology, you have no more long wait times after starting a print job and less wasted printer ink, which makes it much more eco-friendly than solutions that require a plastic cartridge. With fast print speeds of up to 14 pages per minute and excellent color printing quality, one might expect a large machine, but the Phaser 850 keeps things compact. The machine measures 5 inches by 20.8 inches by 17 inches, so it has one of the smallest footprints in its class. There are multiple models available. The 850N has networking as a standard feature, the 850DP adds duplexing (two-sided printing) to the mix, and the 850DX adds the above features plus a large 6 GB hard disk which can store and archive documents for fast printing. All models can be upgraded with extra paper capacity and extra RAM, up to 256 MB total. Most features, such as the hard disk, can also be added as an optional upgrade. This is great news for small office buyers, who may not need all of these features today, but might wish to upgrade in the future, as the office grows in size. 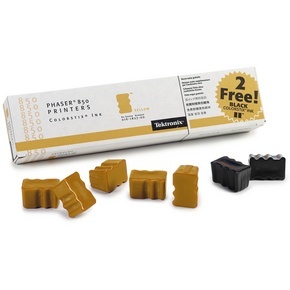 Unlike laser cartridges, Phaser 850 ink sticks come in a solid ink block. When the stick is consumed, there is no cartridge left behind. Xerox 850 ink is less expensive than most lasers in its class, and although Phaser 850 ink sticks require more warm-up time when the unit is first turned on, they have a much faster first page out time. With so many upgrade options, the Xerox 850 can be configured to fit almost any size office, and buyers will get all the benefits of solid ink technology. 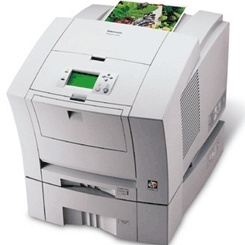 Saving money on Xerox 850 ink will help the office budget, and the machine's compact size makes it an easy fit.